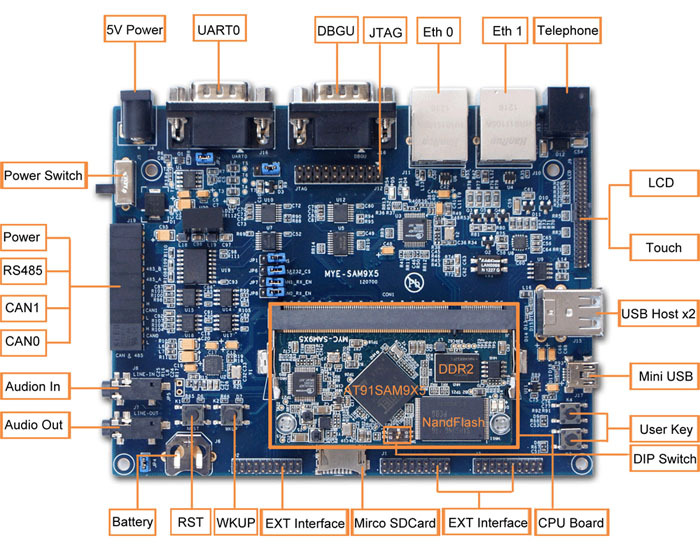 The MYD-SAM9X35 Development Board is among MYD-SAM9X5 series based on Atmel AT91SAM9X35 ARM9 processor which is capable of working at up to 400MHz. The board has a flexible design with one CPU module MYC-SAM9X35 mounted on one base board which is easy for customers to design their own base board or upgrade the CPU module. The CPU module MYC-SAM9X35 is a tiny controller board which has the SAM9X35 processor, 128MB DDR2 SDRAM, 256MB Nand Flash, 4MB Data Flash, 64KB EEPROM and Ethernet PHY on board and connects with the base board through one DDR2 SO-DIMM 200-pin connector. The base board has carried out a set of rich peripherals by headers and connectors including serial ports, USB Host, OTG, one 10/100Mbps Ethernet, two CAN, RS485, Micro SD, LCD, Audio, etc. The CPU module MYC-SAM9X35 is compatible with Atmel's official SAM9X5-EK and can work on SAM9X5-EK's base board directly. The MYD-SAM9X35 boards support running Linux 2.6.39 and Andriod 2.3.5 and is delivered with software packages. It is also provided with sample codes bundle for the peripherals using Keil's MDK-ARM to help users evaluate the Atmel AT91SAM9X5 series ARM9 processors. The 4.3 inch and 7 inch LCD modules (including touch screen), camera, WiFi, GPS and GPRS modules are add-on options which have greatly enhanced the functions of the development board. MYIR also offers detailed documents, user manual, datasheet in one DVD along with some necessary cable accessories to provide an ideal evaluation kit to help users quickly start their development when getting the goods out-of-the-box. With rich peripheral set, the boards can be used for a variety of applications such as industrial controls, medical equipment, automation, portable data terminals, biometric security systems, test and measurement instruments, etc. Note: The MYD-SAM9X35 only supports one 10/100Mbps Ethernet (J11). Note: Our products are delivered of commercial grade (0~70 Celsius) by default. Anyhow the MYD-SAM9X5 board base on Atmel ARM9 processor can work for industrial applications working in harsh environment with working temperature ranging from -40 Celsius to 85 Celsius. Please contact us for price and availability of products of industrial grade if you needed. 1. One MYD-SAM9X5 Development Board includes one CPU module MYC-SAM9X5 mounted on the base board. If you need more CPU module, you can order extra ones. 2. Discount is available for mass orders. Please contact MYIR for inquiries. 3. All prices above are for boards of commercial grade (0~70 Celsius). If customer needs boards of industrial grade (-40~85 Celsius), please inquiry MYIR for availability and prices. 4. We accept custom design based on the MYD-SAM9X5, whether reducing, adding or modifying the existing hardware according to customer’s requirement. Copyright © MYIR Tech Limited 2011-2019 all rights reserved.